Last year, headlines in The New York Times, The Atlantic, Scientific American and other outlets declared that a decades-old paleontological mystery had been solved. The "Tully monster," an ancient animal that had long defied classification, was in fact a vertebrate, two groups of scientists claimed. Specifically, it seemed to be a type of fish called a lamprey. The problem with this resolution? According to a group of paleobiologists led by the University of Pennsylvania's Lauren Sallan, it's plain wrong. "This animal doesn't fit easy classification because it's so weird," said Sallan, an assistant professor in Penn's School of Arts & Sciences' Department of Earth and Environmental Science. "It has these eyes that are on stalks and it has this pincer at the end of a long proboscis and there's even disagreement about which way is up. But the last thing that the Tully monster could be is a fish." "It's important to incorporate all lines of evidence when considering enigmatic fossils: anatomical, preservational and comparative," said Sam Giles, a junior research fellow at the University of Oxford and coauthor of the study. "Applying that standard to the Tully monster argues strongly against a vertebrate identity." Sallan and Giles coauthored the work with Robert Sansom of the University of Manchester, Penn postdoctoral researcher John Clarke, Zerina Johnason of the Natural History Museum London, Ivan Sansom of the University of Birmingham and Philippe Janvier of France's Muséum National d'Histoire Naturelle. "Initially it was published as a worm," Sallan said. "There is a well-constructed argument that it is some kind of mollusc, like a sea cucumber. And there's another very strong argument that it's some kind of arthropod, similar to a lobster." That's why it took the scientific community by surprise when in 2016 two studies came out in close succession both claiming they had firm evidence that the Tully monster was in fact a vertebrate. 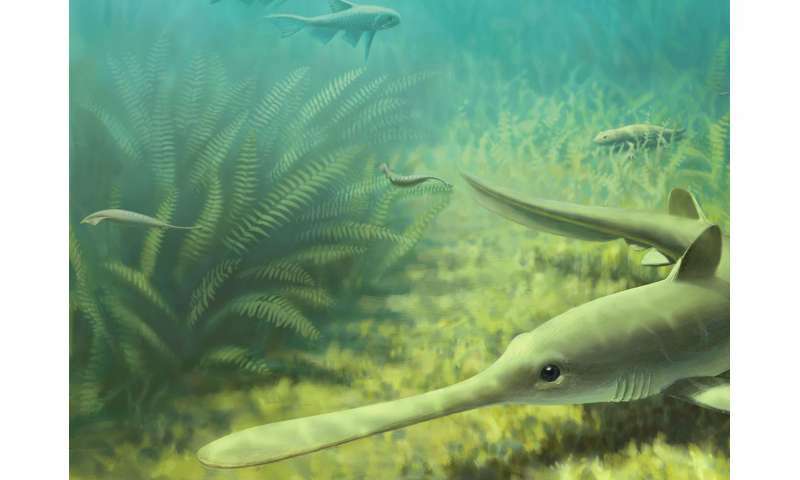 The first examined more than 1,200 Tully monster fossils. In some, the researchers observed a light band running down the creature's midline, which they determined was a notochord, a kind of primitive backbone. They also claimed it contained other internal organ structures, such as gill sacs, that identified it as a vertebrate, and that the animal's teeth resembled those of lamprey. "In the marine rocks you just see soft tissues, you don't see much internal structure preserved," Sallan said. The Penn-led team further noted that there have been lampreys found in this area of Mazon Creek, and that these animals don't resemble the Tully monster. The other 2016 study reported that scanning electron microscope images of the Tully monsters' eyes had revealed structures called melanosomes, which produce and store melanin. That paper's authors argued that the complex tissue structure they saw in the animals' eyes indicated it was likely a vertebrate. "Eyes have evolved dozens of times," Sallan said. "It's not too much of a leap to imagine Tully monsters could have evolved an eye that resembled a vertebrate eye." Based on Sallan's and her colleagues' examination of Tullimonstrum eyes, these creatures in fact possess what is known as a cup eye, a relatively simpler structure that lacks a lens. "So the problem is, if it does have cup eyes, then it can't be a vertebrate because all vertebrates either have more complex eyes than that or they secondarily lost them," Sallan said. "But lots of other things have cup eyes, like primitive chordates, molluscs and certain types of worms." "You would expect at least a handful of the specimens to have preserved these structures," Sallan said. "Not only does this creature have things that should not be preserved in vertebrates, it doesn't have things that absolutely should be preserved." "Having this kind of misassignment really affects our understanding of vertebrate evolution and vertebrate diversity at this given time," Sallan said. "It makes it harder to get at how things are changing in response to an ecosystem if you have this outlier. And though of course there are outliers in the fossil record—there are plenty of weird things and that's great—if you're going to make extraordinary claims, you need extraordinary evidence." As for the true identity of the Tully monster, the Penn-led team said that's still up in the air.